Retail Recall: Trunk Show or Treasure Chest? I attended the Yigal Azrouël trunk show at the George C boutique in Toronto a couple of weeks ago. What I uncovered was a treasure chest, instead. Yigal Azrouël with models at George C. Photo by George Pimentel. Now, George C has always been a trove for beloved non-mainstream designers such as Margiela and Ann D. The man that stands tall behind the store’s name is a fashion reference guide and old school charmer when it comes to sales. He almost talked me into three pairs of shoes on a previous visit. I resisted – if only just – and walked out with two. Did I mention that I had gone in for only one? When I got the invite to the Yigal Azrouël visit, I knew I had to see the pieces for myself, after having followed his designs for a few seasons now. There is an inherent femininity to his pieces but without the fuss, the frou and the frivolous. Leather and drape one-shoulder top by Yigal Azrouël at George C.
Back view, peek-a-boo. Yigal Azrouël asymmetrical top at George C.
He understands a modern woman, understands that some of us have curves to account for. Yigal Azrouël Slashed Dress, SS10. The lines are simple but the elegance is implicit. Beauty is knot that complicated, according to Yigal Azrouël. Whether it’s a column dress or a slashed mini (tunic in my world, please), they are eloquent sentences, unto which the punctuation of a beaded purse or a great shoe will be added. Jessica Stam wearing Yigal's column dress at the CFDA awards in Nov 09. Model wearing Yigal Azrouël dress and leather jacket. Photo by George Pimentel. 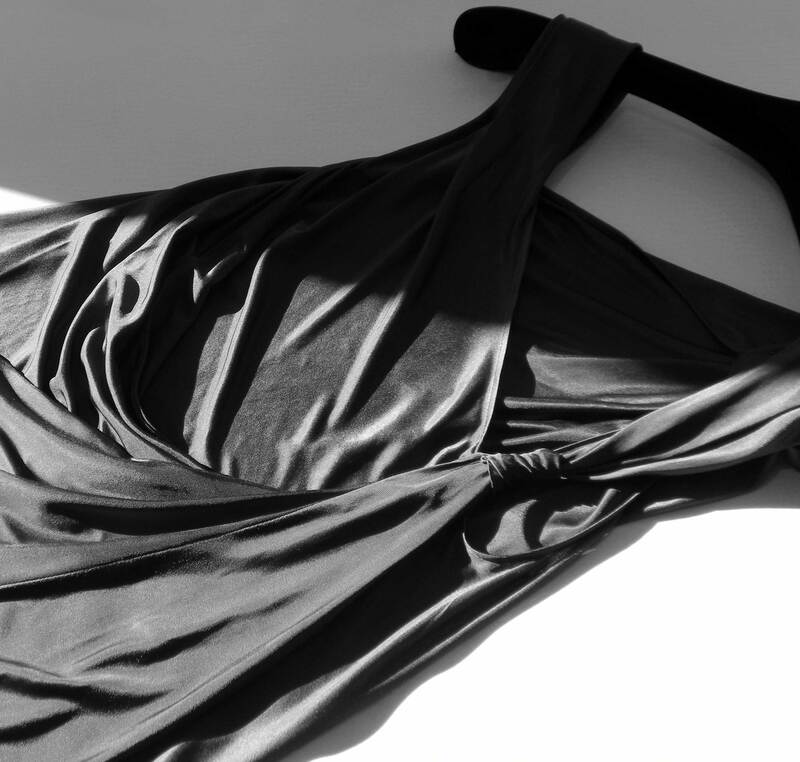 Magical qualities: the slashed dress, close up. 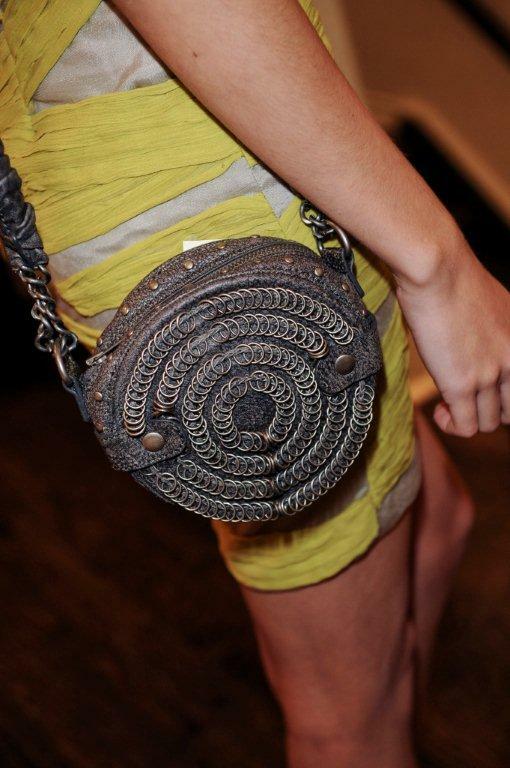 Close up of Yigal handbag. Photo by George Pimentel. It was really a shame that I missed meeting Yigal – he had left the building by the time I arrived (I think you’ll agree after seeing his photo). The designer, as captured by George Pimentel at the George C boutique in Toronto. I did meet his rep from NYC, however, and she was wearing a great Yigal FW 08 fur vest with a knit back and gorgeous Moroccan cuff that I wish I had photographed. Luckily, I can always get my Yigal fix at George C between visits to NYC. Jessica Stam photo from Style.com. 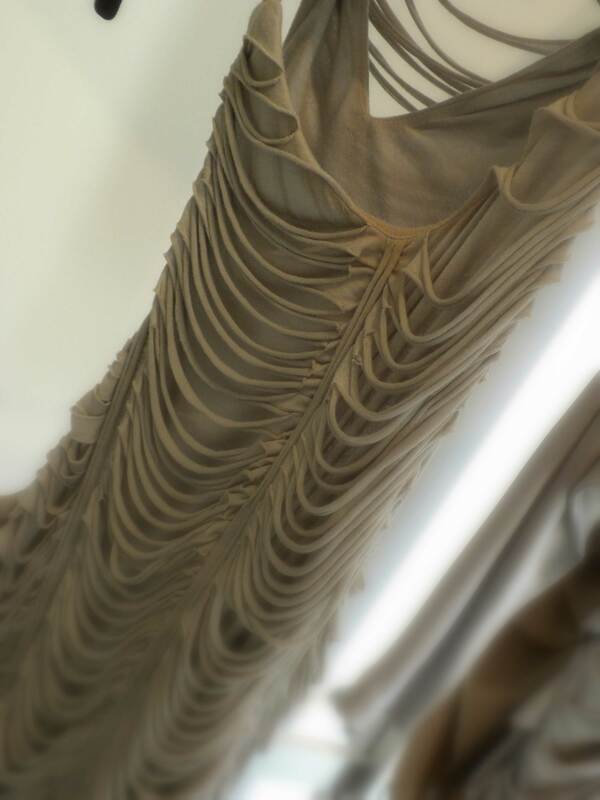 Photos of the trunk show by George Pimentel, where noted. All other photos by moi. Please credit if you are using any of them.